This streamlined Chromebook is designed to balance mobility and productivity for professionals, students, and educators alike. ThinkPad 13 Chromebook is built to pass 12 Military Specification tests for durability, so it can withstand the travails of the boardroom and the classroom – yet it’s still lightweight and features a battery that lasts a full work day. 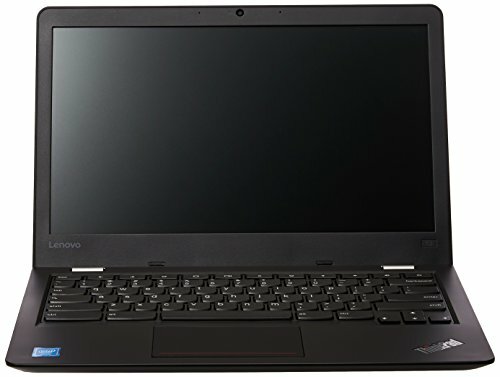 Ultrafast USB Type-C Data Transfer Rate ThinkPad Chromebook is equipped with two USB Type-C ports, for powerful and fast connectivity to peripherals. USB Type-C can charge your laptop or your peripherals and provides video and data I/O. The connector is also smaller – narrowing the gap between device and connector size – and reversible, meaning it doesn’t have to be oriented "correctly" to connect to the port. Thin and Light Design; Long Battery Life Starting at a mere 3.2 lbs. (1.4 kg) and just 0.78" (19.8 mm) thin, this Chromebook is ultraportable – it’s perfect for productivity on the go. And with up to 10 hours of battery life, you can work a full day without recharging. Tested to Military Specifications Military-specification testing validates the ruggedness, durability, and quality of this Chromebook by conducting 12 tests. Integrated 720p HD Webcam Dual Noise-Cancelling Microphones Enjoy superior web conferencing on your Chromebook, which includes a low-light sensitive 720p HD webcam with wide-angle viewing and face-tracking, dual noise-cancelling microphones with configurations for crystal-clear private and conference mode VoIP meetings, plus, convenient multimedia keys for quick and easy access to microphone, speaker, and camera controls. Key Features: Get reliable performance from the Intel 3855U Dual-Core 1.6GHz processor 13.3" HD LED-backlit display with 1366 x 768 resolution showcases movies and games in stunning clarity eMMC 16GB solid state drive for an amazingly smooth and fast computing experience 4GB DDR3 memory - For multitasking power Enhanced viewing with the integrated Intel HD 510 graphics Wirelessly connect to a Wi-Fi signal or hotspot with the built-in 802.11ac wireless connection Easily link with other Bluetooth-enabled devices, such as a mobile phone or MP3s players Chromebooks are automatically kept up to date, so you’ll always have the latest virus protection. Best of all, your Chromebook won’t slow down over time. Shipping Note: Shipping to Alaska and Hawaii is not available for this item A physical address is required for delivery. No Military or PO Box shipments available.